Usain Bolt started slowly. He usually does. In the video of the race, you cannot see it with the naked eye, not in this sport which is measured in hundredths of seconds. But the runners’ starts are digitally timed, and Bolt was out of the blocks in .155 seconds—the second-slowest in the eight-man field, a significant .027 seconds slower than Akani Simbine of South Africa. Bolt is generally slower out of the blocks than he was at the start of his career. It has been suggested, and sounds logical, that he is a little gun-shy. In 2010, the IAAF changed its rule on false starts. Whereas runners used to get one mulligan, now a single false start is enough to eliminate you from competition. 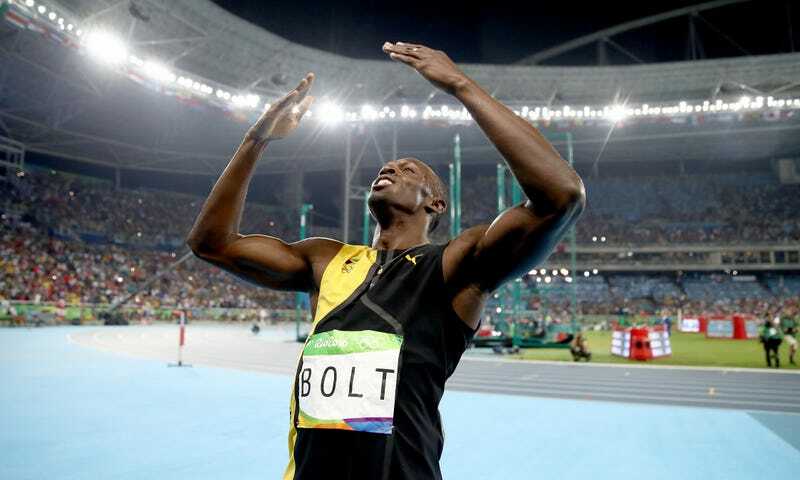 At the 2011 World Championships in South Korea, Bolt false-started. He has not done so since then; he has not failed to win an important race since then. He’s not worried about his relatively slow starts, because he’s never not won in spite of them. Once Bolt is out, it takes longer for him to get up. At six-foot-five, the same ranginess that gives him his ultimate edge also causes him to unfurl his body relatively slowly, compared to his more compact competitors. He is the last in the field to achieve full stride; he starts from behind; this is the way it has always been. If you are going to beat Usain Bolt in the 100 meters (you are not), you have about 50 meters to build your cushion. His stride is so long and so powerful, he covers more distance with each step; he needs fewer of them to complete 100 meters. Gatlin’s advantage was painfully brief. In the time it took NBC announcer Tom Hammond to declare “but Gatlin has a big lead!” Bolt had drawn even. By the time Hammond asked “can Bolt catch him?” Bolt had pulled in front. Bolt hits his top speed at around 60 meters. Last night, as it is most nights for him, the rest is a victory lap. It is where he pulls away—not by speeding up, all sprinters are slowing down in the last few dozen meters, but by maintaining his speed as his competitors fall off—and it is where he takes stock of things around him. In the final, there was no wide smile, no turning his head to survey his competitors as in his semifinal heat. But there was, it appears, the briefest of glances up toward the stadium video board—to watch himself finish first. Bolt finished in 9.81 seconds, a relatively slow time for him, but a comfortable one. The distance between him and Gatlin in second place was greater than the gap between second and sixth. Last night, Bolt was asked to put his career in perspective. This is his last Olympics, he maintains, even though Gatlin, who would be the world’s fastest man if Bolt had never existed, is five years older. But Bolt’s almost ready to wrap it up.